The AMWU is leading a campaign to prevent work related and environmental cancers. A modern epidemic, one in ten cancers are a result of workplace exposures. Indeed, in 2006 it was estimated that 1.5 million Australians or 20% of all workers were exposed to carcinogens at work. These exposures, and the resultant cancers, are entirely preventable. 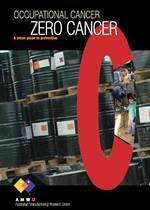 This booklet provides a multitude of information about work related cancer and the campaign to prevent it. The types of exposures that are responsible for work cancers and the types of jobs that are often related to those exposures are examined. Suggestions of what people can do to aid in this fight against work related cancers are offered, as are the responses required from both government and employers.